Profs. 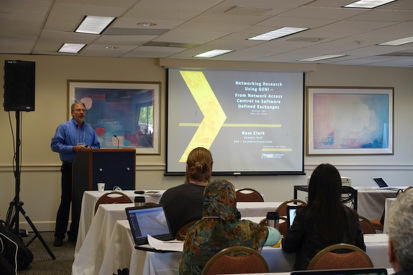 Abraham Matta of Boston University (BU) and Violet Syrotiuk of Arizona State University (ASU) organized a GENI Regional Workshop and a GENI Summer Camp at BU. 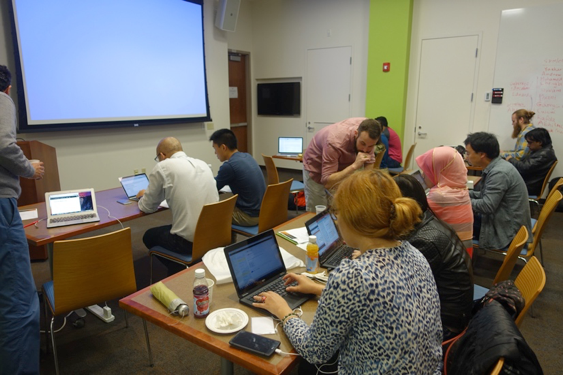 The Regional Workshop, held on Monday May 23, attracted over 40 participants, most of whom were from universities in the Boston area. The morning of the workshop included an Introduction to GENI by Mark Berman, GENI Project Director; a talk by Russ Clark of Georgia Tech on his research on GENI including Software Defined Exchanges (SDXs); and a talk by Tilman Wolf on ChoiceNet, an economy plane for the Internet. The afternoon consisted of two tracks of tutorials. 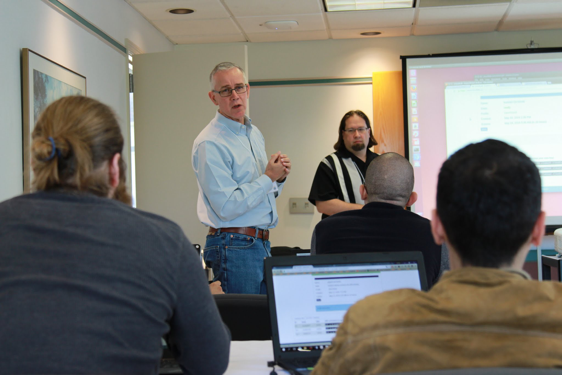 Violet Syrotiuk led the My First GENI Experiment tutorial, Kobus Van der Merwe and Kirk Webb delivered tutorials on CloudLab and PhantomNet, and Geddings Barrineau led an OpenFlow tutorial. The tutorials were selected based on preferences expressed by workshop participants during registration. A Software Defined Networking (SDN) based firewall. 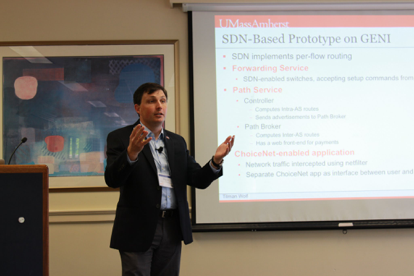 Only known switches were allowed to connect to their OpenFlow controller and only traffic from whitelisted networks were allowed into the internal network. Covert channels in GENI. Information was coded as delays between packets using a scheme similar to Morse code; each letter of the English alphabet was coded as a sequence of long and short delays between packets. Decoding error rates were compared over low-latency GENI rack-local links and over high-latency links between GENI resources on the east and west coasts of the US. Software defined radio. The team programmed a software defined radio at New York University to receive and decode transponder transmissions from aircraft flying over Brooklyn, NY. Using SDN to reduce the complexity of iBGP peering. Their OpenFlow controller acts as an iBGP peer and installs flow rules on internal routers. This eliminates the need for all iBGP routers to form a full mesh. The feedback from camp participants was overwhelmingly positive. All respondents to an online survey said the camp was well organized and met their expectations. Coming into the camp, 80% said they have very little to no knowledge of GENI but by the end of the week 80% rated their knowledge of GENI to be high. All respondents said they plan on using GENI for their research or teaching. Many attendees said they would have liked more time to work on their projects. Many thanks to Abraham Matta and the staff of the Hariri Institute at Boston University for hosting the workshop and summer camp. Regional workshops deliver a focused introduction to GENI, using lectures and hands-on tutorials, that new users find most helpful to begin using GENI effectively in their work. Week-long camps introduce participants to the wide range of experiments possible on GENI. The projects at the camp help develop sufficient GENI knowledge and skills for the participants to start using it immediately for their research. The next GENI Regional Workshop will be held in the Fall of 2016; subscribe to the geni-announce, geni-users or geni-educators mailing lists for announcements. If you are interested in hosting a workshop or camp, please email help@geni.net.